American Honda Motor Co., Inc., today announced the installation of its largest commercial solar-cell demonstration project in the United States, at Honda Performance Development (HPD), Inc., the company's advanced motorsports engineering facility in Santa Clarita, CA. The 100-kilowatt, 800-cell array of thin-film CIGS solar panels, manufactured by Honda Soltec Co., Ltd., are installed on the roof, carport, and loading dock canopy at the headquarters of HPD, where the company develops engine technology for the IZOD IndyCar series, the American Le Mans Series, the Le Mans Series in Europe, and other racing programs. The Honda solar array complements other unique environmental technologies installed at the facility, as well as HPD's plans for "green racing" motorsports programs. Honda Soltec is a wholly-owned subsidiary of Honda based in Kumamoto, Japan. The solar demonstration project is one of Honda's largest to date, providing power to several areas of the HPD research-and-development campus, while reducing energy loads and CO2 emissions. Energy produced by the solar array is expected to reduce CO2 emissions by approximately 64 metric tons annually, according to Honda estimates. The system features a solar tracking system that allows some panels to follow the path of the sun and is designed to power an electric vehicle charger, demonstrating Honda's vision for a sustainable energy management system that incorporates Honda solar cell and electric vehicle technologies. Energy output will be monitored in real-time through an internet-based monitoring system. "The installation of Honda Soltec solar panels along with an electric vehicle charging station at one of our most advanced Honda facilities in the United States represents a big step for us in our solar product development," said Mike Hodge, manager of Honda Home Energy for the Power Equipment Division of American Honda Motor Co., Inc. "What we learn from this new project at HPD will provide real-world data and feedback on the use of Honda solar cells in a typical commercial application." Using a thin-film compound of copper, indium, gallium and selenium (CIGS), Honda's next-generation solar cell requires less raw material and 40 percent less energy, and related CO2 emissions, to manufacture compared to conventional crystal silicon solar cells. Earlier this year, Honda Soltec introduced a new CIGS cell with a smaller solar panel design, adding to more efficient installation in limited spaces on a wide range of roof shapes. The conversion efficiency of the new solar cell module is expected to exceed 13 percent, ranking it among the world's most efficient CIGS-based thin-film solar cells. 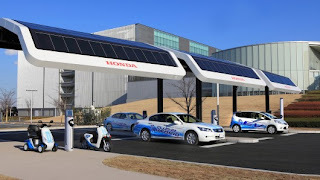 In Japan, where Honda first began selling its CIGS solar cells in October 2008, Honda is utilizing Honda Soltec solar cells in 15 facilities, including most of its factories and major R&D facilities, with a total output of 2.5 megawatts. HPD is American Honda's North American racing development and sales organization, operating out of a 123,000-square-foot building in Santa Clarita, CA. The two-story structure houses comprehensive motorsports research and development operations, including design, development engineering, prototype and production parts manufacturing, race-engine preparation and rebuilding areas, and a material analysis laboratory. Recently, HPD has undertaken a number of "green racing" motorsports initiatives, including developing and campaigning hybrid and alternative-fuel Honda race vehicles. In the area of green-building technology, HPD already utilizes a thermal energy storage system that employs chillers to produce ice during off-peak evening hours, as well as using energy-efficient lighting fixtures with motion sensing capability, and a drip-type landscape irrigation system. Also debuting at HPD is the award-winning GE WattStation* electric vehicle charger that can be used to charge the Honda Fit EV battery electric vehicle, set to be introduced to customers in the U.S. and Japan in 2012. The Fit EV is designed to meet the daily driving needs of the average metropolitan commuter and incorporates the same five-passenger layout found in the popular Fit hatchback. The GE WattStation is an easy-to-use electric vehicle (EV) charger designed to help accelerate the adoption of plug-in electric vehicles (PEVs) by significantly decreasing time needed for vehicle charging. The WattStation can charge an electric vehicle in as little as four to eight hours. Its smart grid-enabled technology also can help utility companies manage the impact of EVs on the local and regional grids. Striving to achieve the Honda Environmental Vision of realizing "the joy and freedom of mobility and a sustainable society where people can enjoy life," in 2011 Honda established voluntary CO2 emissions reduction targets to address the critical issues of climate change and energy sustainability. At the same time, Honda introduced a global environmental image -- 'Blue Skies for Our Children' -- that draws directly from Honda's environmental heritage. In 2006, Honda became the first automaker to announce a voluntary goal to reduce global CO2 emissions from the use of its motorcycles, automobiles and power equipment products by 10 percent by the end of 2010 (as compared to year 2000 levels). In 2010, the goal was attained for all products. Honda has now set a new target, to be achieved by the end of 2020, to reduce CO2 emissions from the in-use stage of its automobile, motorcycle and power equipment product lines by 30 percent, as compared to year 2000 levels. Honda is a leader in the development of pioneering environmental technologies to improve fuel efficiency and reduce CO2 emissions, including vehicles powered by advanced gasoline- and natural gas-powered engines, as well as gasoline-electric hybrid, battery-electric, plug-in hybrid and hydrogen fuel cell-electric vehicles. In 2010, Honda was named America's "Greenest Automaker" for the fifth consecutive time by the Union of Concerned Scientists. In addition to fuel efficient vehicles, Honda's environmentally-responsible product portfolio encompasses energy production and distribution technologies, including Honda CIGS solar cells and an experimental, solar-powered hydrogen refueling station in operation at the company's North American headquarters in Torrance, CA. HPD is a subsidiary of American Honda and is the organization's racing company within North America. Founded in 1993, and located in Santa Clarita, CA. HPD is the technical operations center for American Honda's high-performance racing cars and engines. In addition to its commercial motorsports business, HPD is the single engine supplier to the IndyCar Series and spearheaded Acura's championship-winning efforts in the 2009-2010 American Le Mans Series. Established on December 1, 2006, Honda Soltec, Ltd., is a wholly-owned subsidiary of Honda Motor Co., Ltd., responsible for the development, manufacture and sales of Honda-developed solar cells. Honda Soltec began sales of Honda CIGS thin-film solar cells to residential customers in Japan in October 2007, and extended sales to commercial users in Japan in October 2008. Honda Soltec operates a production plant in Kumamoto, Japan, with the capacity of 27.5 megawatts, in operation since October 2007. Honda does not market its solar cell technology to customers in the United States at the present time.